Google released Pixel and Pixel XL a few years back. It is said to be one of the best Android smartphone of 2016. Its camera quality has got the highest result in a reputable bench-marking tool. Pixel and Pixel XL look great and they are very comfortable to hold in hand because of their design. If you have lost your Pixel and you are looking for ways to find it. In this guide, I will tell you a trick which can help you to track and locate lost Google Pixel remotely. Google Pixel has an optimal display size of 5 inches whereas Pixel XL is of 5.5 inches. Both devices have premium build quality with aerospace grade aluminum uni-body. They are equipped with 4GB LPDDR4 RAM and Snapdragon 821. The back camera is of 12.3 megapixels and the front camera is of 8 Megapixel. On the bottom side, both phones support USB type-C for charging and data transfer. Pixel is running on the latest Android operating system that is Android 8 Oreo, and it still gets regular updates. If you have lost your phone. 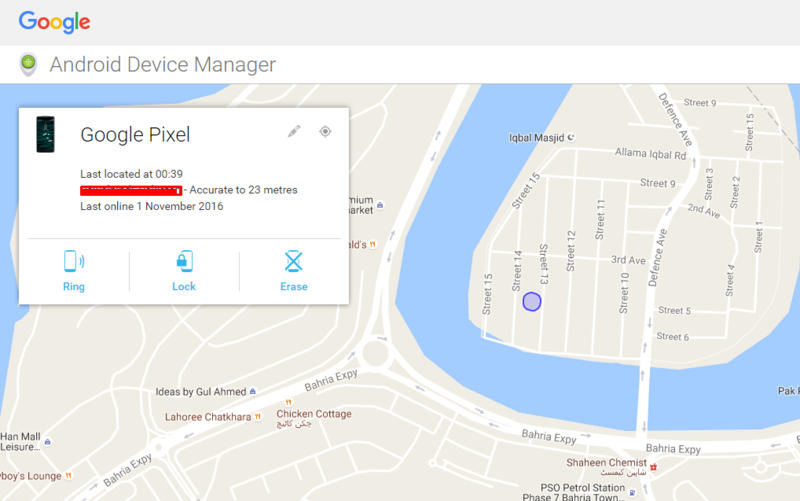 You can make use of the Android device manager to track and locate lost Google Pixel. Android device manager offers a number of services that can be used to remotely on your phone. All you need is an internet connection and some other smartphone or you can locate your phone using a PC. First, let’s have a look at the features it has got to offer. Ring: If you are certain your phone is present inside the home or office. It is on silent so you can ring it and find it. Use this feature to make it ring on its highest volume. Locate: You can see the exact location of your phone on google maps using this service. It has limitations. Your phone must be connected to the internet and your lost Google Pixel must have its location services on. Lock: If you have forgotten your phone somewhere and you have hopes that someone might find it and try to contact you. Use this feature to lock down your phone and display a custom message on its screen along with your contact number. This method works but it has some limitations, like if your phone isn’t connected to the internet. You won’t be able to access its location or track it. To be able to track and locate lost Google Pixel. You need to have access to your Google/Gmail account that you used on your phone for the Google Play Store. The same email which you entered when you first opened your phone. First of all, go to Android Find my Device website or download it on your iOS or Android device from their respective app stores. Select your phone. Which in this case is Google Pixel or Pixel XL. You will see the location of your phone on Google Maps. Along with it you will see different options like lock, erase and ring. That’s all. If you know some other methods to locate lost Google Pixel do share with us. If you have any issues or questions regarding the above guide. Let me know in the comments. If you were able to get back your Google Pixel or Pixel XL using the guide above. Do share your story with us. Stay safe and take good care of your phone. We only realize their importance once we have lost them. Feel free to ask us if you have any questions or your phone is stuck into some problem and you can not find its solution. Our Support team will be happy to help.